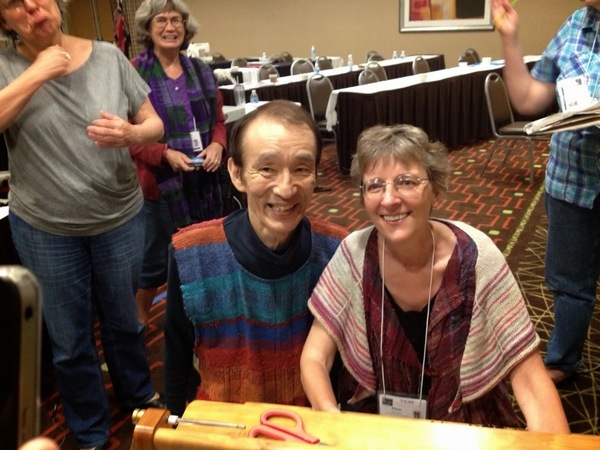 Since I was a member of the conference committee and planned this with the host Denise Prince (HanDen Studio) and Sakaiseikisangyo Co. (Kenzo and Akiko Jo), I was a bit nervous before. I don’t have any pictures of the fashion show at the opening night. I was busy doing MC and organizing the show. People seemed understood about SAORI style of fashion show. Audience became models and models went back to seats to be audience. There were many wonderful variety of clothing. It was a great praise for me to receive words from Kenzo and Masako saying that they saw huge growth compared to the previous conference two years ago. It is true that there were many creative patterns and weaving. Several patterns were no sewing and no cutting. I lead two workshop on the weekend. One was making a hat without sewing. I was really not sure since I have not made this hat for a long time. So I talked to teachers from Japan and Misuzu agreed to help me for that. I was so glad that she was there to give us tips to adjust each fabric to make shapes. This pattern is very popular in Japan for more than decades. Many people in Japan make this hats to donate to cancer patients who loose hair for the chemo therapy and Misuzu is one of those people. She donates at least 100 hat in a year and she has been doing this for several years by now. She wove fabric for hats and some of her students help to make it to hats by pulling threads, tying knots and braiding. Everyone who made hats looked so happy. 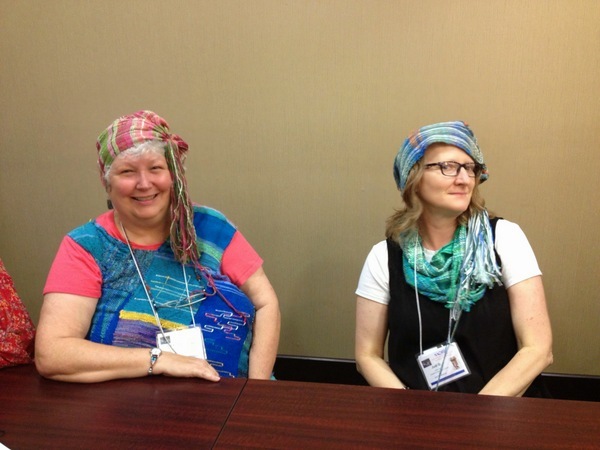 Some wore the hat throughout the rest of the conference! 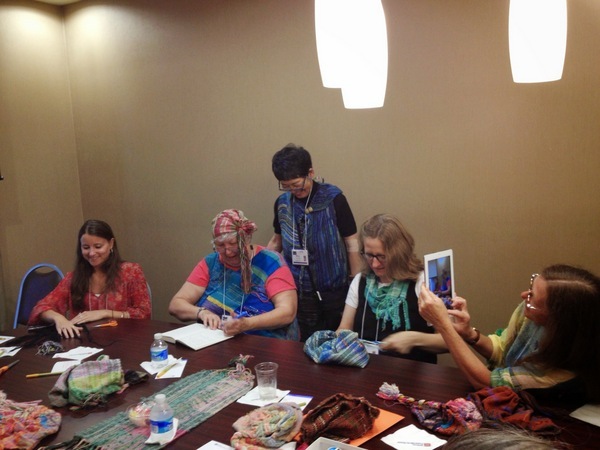 Another workshop I lead was about the construction of SAORI clothing. Actually until Kathleen Keenan (SAORI SRQ) asked me for the workshop at her studio last January, I didn’t realize that it helped people so much to understand the written pattern in the books. Using receipt paper tape is the way I learned originally in Kyoto SAORI studio. I have been using this way all the time and have shown to my students at my classes. 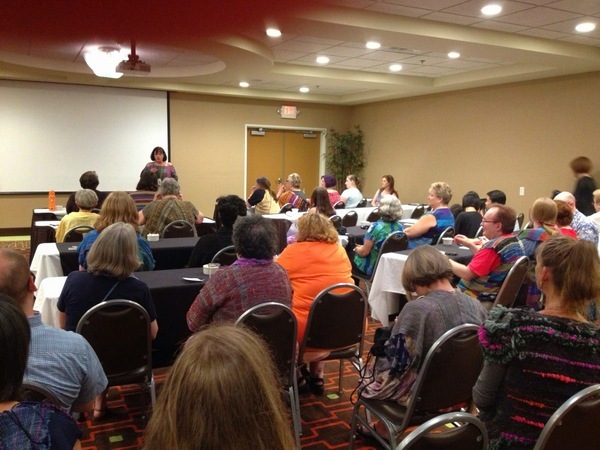 However, I didn’t think this could be a workshop for those who have never sewn or who are not comfortable sewing yet. When I showed paper patterns at SAORI SRQ, ladies mentioned that it would be more helpful if they made the paper patterns with me. That’s how this idea came to me. I had many positive comments from the participants. Again, I didn’t have time to take pictures during this workshop. Hope I will have some later (Hanley was taking some.). Now I have more idea how to make the workshop better. It is my joy to help people understand something. I am open to any feedback, too. The post conference is Kenzo and Masako’s show. They allowed enough time for the participants to do hands on both on the looms and the sewing machines. That was incredibly well received. 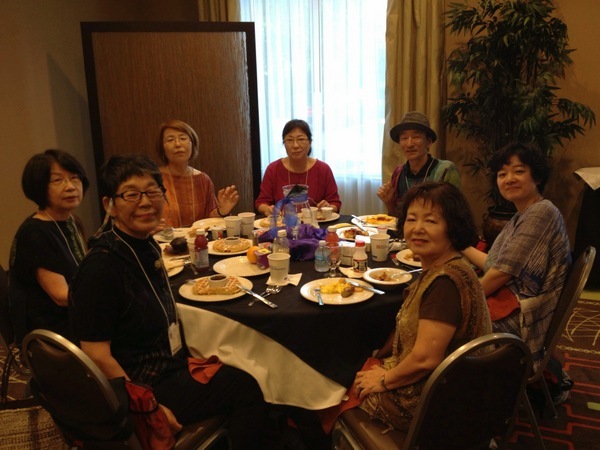 I was so grateful to make new friends who have learned SAORI at other studios and occasions. I thought about the first conference in 2006 that my exhusband and I hosted. At that time about a dozen people whom we invited came. The small interests grew and spread out as SAORI movement and it made me so rewarding. As an organizer, I have several things we could have done differently. However, I enjoyed the entire week full of excitements and friendship. Mihoko, if you were at all nervous, we certainly couldn’t tell! Your hosting duties and your workshops were great! I found so much inspiration at the conference and the workshops that I have been neglecting all else here at home since my return. It will be a long wait for the next conference! It was such a pleasure meeting you at the conference! 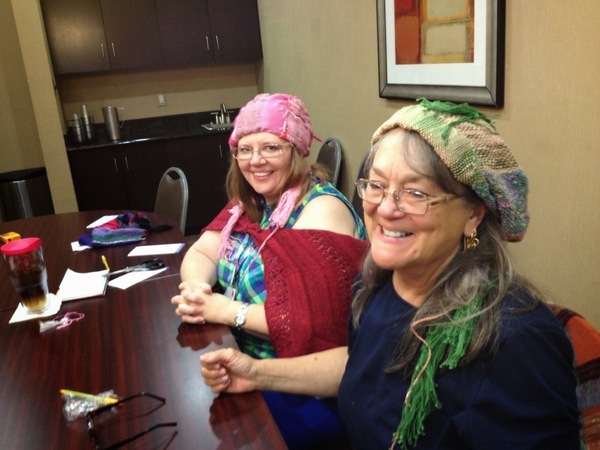 I enjoyed both your classes very much…and I do love my hat!